What is the H.B. Fuel Fund? Support Karen as she prepares for the 2014 Iditarod Sled Dog Race. You can follow her blog and all the antics at NorthWapiti Kennel and her 60+ Siberian Huskys here, prepare to laugh and enjoy the ride with lots of ups and downs in the preparation of the race and more coverage as Karen races across Alaska with 16 of her best dogs. The 406 miles of RAGBRAI is nothing compared to the skill and determination it takes to be out on the 1049 mile trail. Well, my bike is in a box and on its way to Iowa via Fed Ex. I have a pile of clothes to take and am getting myself ready to go away for this amazing adventure! Shelly, our support person, is doing an awesome job of getting things ready for us from a tent and sleeping bags to food and friends! It looks like it will be quite a hot week so that means plenty of fluids and paying attention to keeping hydrated. A friend asked me today about my hydration plan - yikes, I didn't know I needed a hydration plan! I guess just drink a lot of water and lots of electrolytes too. I leave Friday morning and am looking forward to having a day in Iowa before all of the festivities start. Reflecting on how much I don't know about what this upcoming week will be like and how the anticipation and excitement are building! I am so grateful for all of the donations to the HB Provisions Fuel Fund and am hoping there will be more coming in as the week progresses. It feels so good to be doing something that will benefit others and will make their life a little better. Karen Ramstead and I will be riding in RAGBRAI (Registers Annual Great Bike Ride Across Iowa) from July 21 to July 28, 2013 with Shelly Lewis accompanying us in the support vehicle! We are gals that love winter (dah, who doesn't!) and our fund raising efforts are both winter related. Karen is raising funds to support her 2014 Iditarod Sled Dog Race Team and Helen is raising funds for the H.B. Provisions Fuel Fund. Join us here as we blog, photograph and post interesting things about RAGBRAI! 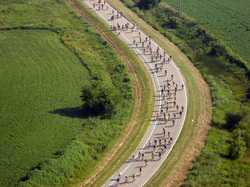 You can read musings about RAGBRAI below. Shelly got our RAGBRAI packet! 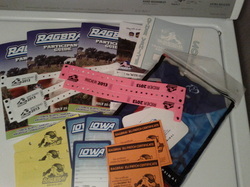 6/6/2-13 - RAGBRAI is getting closer and becoming a reality! Shelly got our wristbands and all the important stuff we need, it is time to get really serious about this! Fast forward a month and I have been riding 3 to 4 times a week, 20 to 30 miles each ride. Now I am excited and looking forward to the ride. I have also changed my thoughts from dread and 'what did I get myself into" to 'this is so cool, I am excited and loving getting ready for the ride'. What is this ride you ask? It is called RAGBRAI (Registers Annual Great Bike Ride Across Iowa) and is an opportunity to ride all 406 miles across Iowa from Council Bluffs to Fort Madison, or the Missouri River to the Mississippi River. Following the RAGBRAI trail across Iowa we will ride between 49 and 83 miles a day from July 21 to Juy 27. Read more about RAGBRAI at www.ragbrai.com. Now my friend Karen is an internationally known dog musher from Alberta,Canada and she is raising money for her 2014 trip to the Iditarod Sled Dog Race with her dog team of gorgeous Siberian Huskys,www.northwapiti.com. She has an awesome blog with loads of great stories about her dogs and life as a musher! She is truly an inspiration of someone who grabs a dream and follows it. 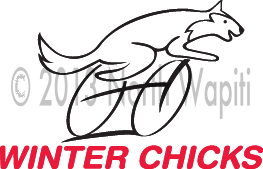 Well our team (of 2) is called "Winter Chicks" and so I decided I also wanted to raise money for a cause near and dear to my heart, the H.B. Provisions Fuel Fund (for more on my connection to H.B. Provisions http://www.hbprovisions.com/aboutus.htm). The Fuel Fund is an opportunity to help folks in the local area of Kennebunk, Kennebunkport and Arundel, that need assistance with fuel to keep warm in the winter. I am a lover of winter and I can only imagine if I struggled each day to buy fuel to stay warm that I would learn to dread winter, so the Fuel Fund is a way to make sure folks stay warm. The money is given to local fuel companies that decide who are good candidates for the assistance, it may be for someone that might come in with $50 at a time for fuel or others that they know keep their heat at 55F. Since the inception of the Fuel Fund almost $10,000 has been raised and distributed locally, this is money that is collected in a jar at the cash register, it is the spare change or extra money that customers donate by dropping it in the jar. There have been people dropping anything from $100 dollar bills to pennies and it all adds up. If you see me out riding the roads as I am preparing for this adventure across iowa give a gentle honk or a wave which of course will warm my heart and keep those pedals moving! !